GVM present to the market the two bedroom detached cottage style residence standing on a large 1.3 acre site. 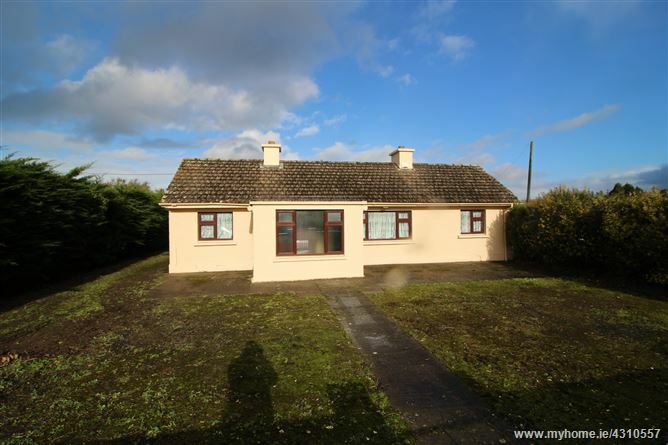 This property is located on the main Limerick to Foynes Road (N69) and is in need of modernization but offers huge potential to any intending purchasers an opportunity to acquire a property situated just 10 minutes drive from Limerick City. Entrance Hallway 1.7 X 3.1 :- Alarm point. Sitting room 4.4 X 2.8 :- Carpet flooring. Open fireplace. 1 double socket. Bedroom 1 2.2 X 3.4 :- Timber flooring. 1 double socket. Kitchen 3.0 X 4.4 :- Open fireplace. 3 double sockets. Bedroom 2 3.3 X 3.3 :- Carpet flooring. 3 double sockets. Utility 1.0 X 4.1 :- Sink. Double socket. 1. Circa 1.3 acre site. 7. Garage 3.3 X 6.2 and various out offices. Traveling from Limerick City proceed out the N69, proceed through Mungret Village and property is located on the right hand side. GVM sign thereon.